Painters, electricians, drywallers, gardeners – many artisans have to keep up in the air, and how it works in general, is known: Head up, climb, stand the limited range of motion, again descend, head to carry on, and up again. This is not only tedious and time consuming, but also unsafe. With the work of our professional stilt-Line is all that much easier, more effective and therefore economically optimal. Drywall for example, have told us that they save up to 75% on time. 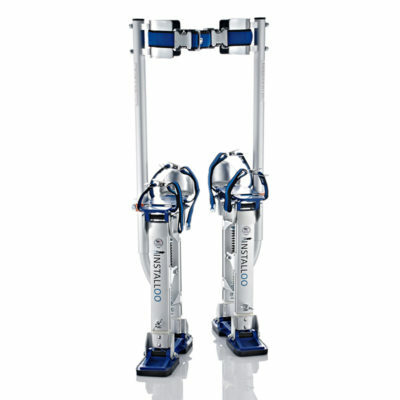 What is the great advantage of our Pro-Line stilts? 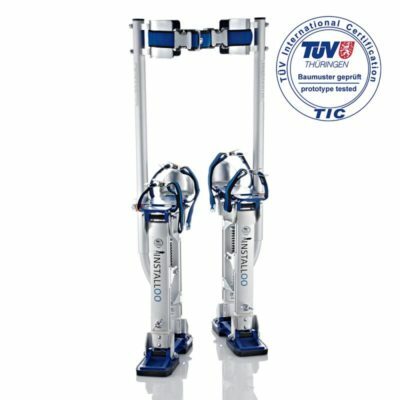 You can dispense up to 99% with the use of a ladder, because with the Pro-Line stilts you are up to 1 m or more and a lot more flexible than on a circuit: Because our work stilts – also known under the name Gehstelzen, artisan stilts, parallel stilts or aluminum stilts (Alustelzen) – can craft activities in the amount done easily and conveniently. Instead handle after each handle to the circuit, the stilts once strapped and you are free to move it. This saves time and adds even more security than a wobbly ladder. Painters, plasterers, restorers, drywallers, electricians, builders stretch ceilings, gardeners, fruit growers. They are ideal for the hail net installation, interior design, for window cleaner or commercial cleaning. Likewise, but also for purposes that do not allow the practical utility, but the stilt walking is in itself at the center: for artists and entertainers, for walking acts or for advertising and event agencies. Tip: Walking on stilts is our easy to learn – even after 5 to 15 minutes of exercise, you can move out routinely in general.